Gagarin was much celebrated and became a legend in USSR. He died tragically in an accident in strange conditions. He got serious wounds, and was sent to China to heal his wounds; to hide the failure, the Russians authorities said he had had an accident. The Russians had lost a trained man and a capsule, and the time was running short: The Americans were about to send their own first man to space. Miraculously, the Russians managed the exploit, to beat the Americans in the space race, and send the first man ever in space. Just some days later, rumors of hoax began to spread. The doubters were outlining many anomalies about this flight. The article shown here comes from the newspaper "Palm beach post" dated April 19th 1961. So if you have followed the Gagarin story so far and read through the article above probably this paragraph caught your attention. 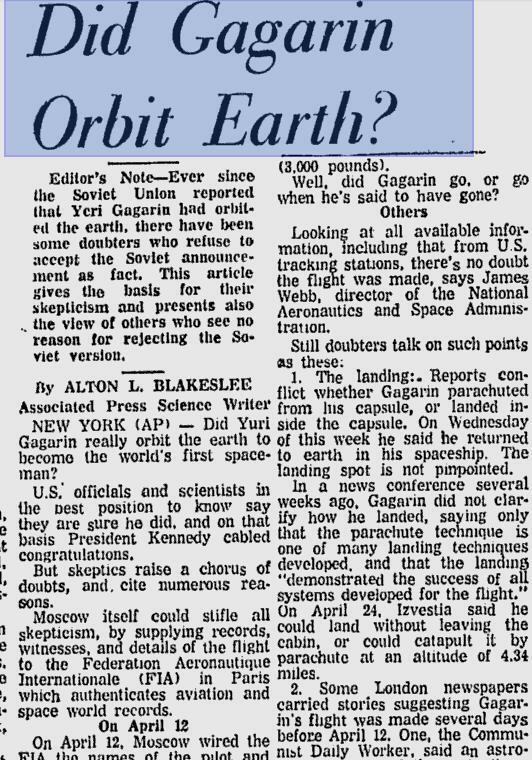 Although researchers, politicians, and journalists all doubted the veracity of the story of Gagarin having conquered space: NASA were the only to vouch for the authenticity of the scam. From what we have learnt so far about the cosmonaut gagarin Hoax, it was thanks to NASA's sponsorship that the hoax was finally accepted by the US. Headlines about Gagarin in the "USA": Now They all believed that he was really in space, without one single foto of the "space flight". 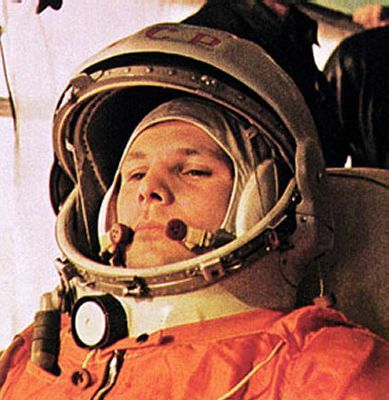 Gagarin is dressed in a parachute jumping suit. 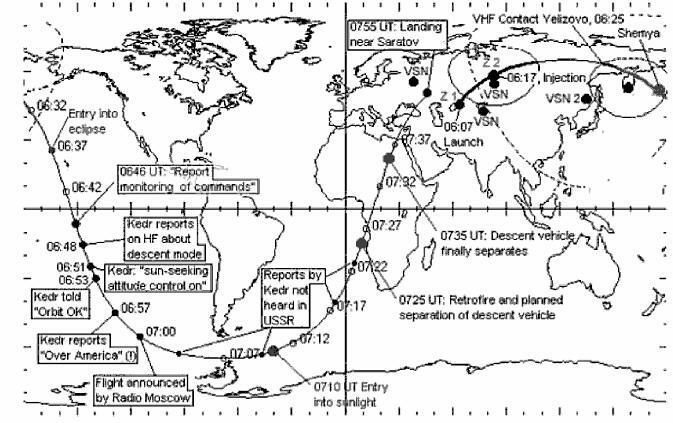 Headlines about Gagarin's alleged atmosphere flight, e.g. 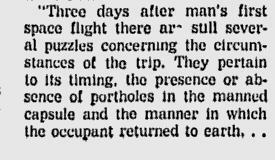 the report of Huntsville Times from 12th April 1961. Gagarin's alleged landing capsule. Here a capsule is recovered in the snow. 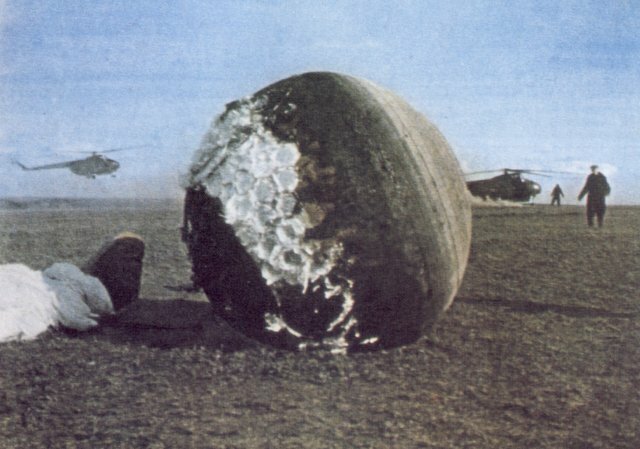 Gagarin's alleged landing capsule on a meadow with recovery by helicopters in the background. 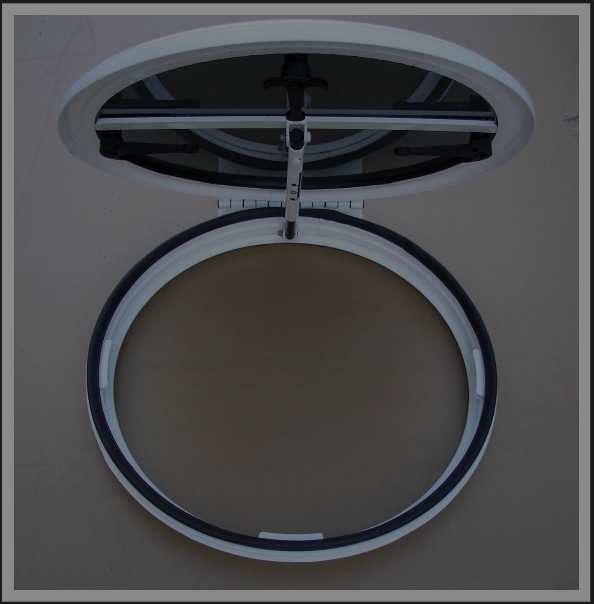 The abrasion is different to the landing capsules before. Note: A movie hammering the hoax into our minds was released this year. 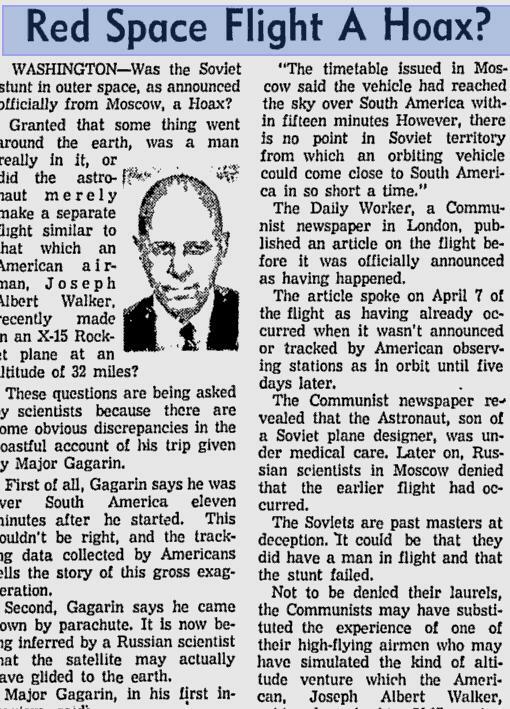 The newspaper articles above show that Gagarin's flight was surrounded with many anomalies that the soviet authorities gave no explanations about. These anomalies are going to be described in what follows. First, just before the departure, the hatch was reopened for an unexplained reason. Then, and it's the main point, It seems Gagarin was systematically announcing itinerary events long before they were really occurring. 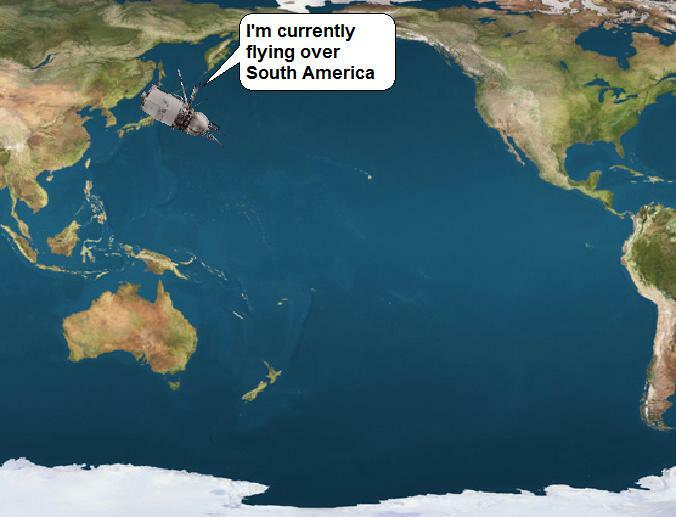 Gagarin announced he was flying over South America whereas he had not still covered the third of the distance separating his departure point from South America! Indeed, he made this announcement less than a quarter of an hour after he departed, and he was needing at least three quarters of an hour to reach it (this is what his successors needed). On it you can see several France departments! How could one distinguish things as minute as fields and farms? In fact, it was most probable that it was a tape-machine which was talking, and not Gagarin, and that this tape-machine would have started too early, which would explain the time shift between the oral transmission and the actual position of the space ship! ...Whereas the russian space rocket chief said his space ship had no porthole! ...while his space ship (Vostok) was crashing on the ground. And still more strange, Gagarin landed exactly at the place he used to do his parachute trainings! 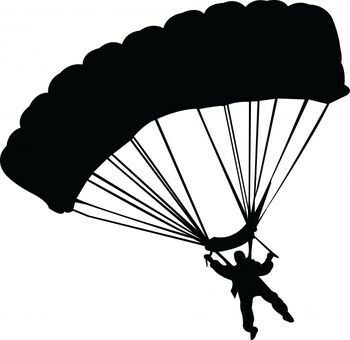 In fact, it seems very probable that Gagarin was dropped from a plane. 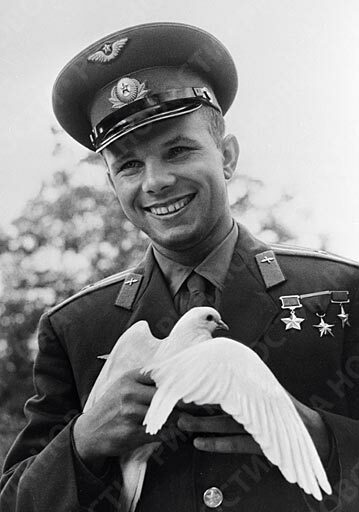 Another strange thing: On this official picture of Gagarin taken just before he departed, he has a bruise at an eye he only got some months later in an accident! Gagarin also wrote in his memoirs he had a blue space suit, when the officials said he had an orange one! How is it possible to forget such a thing? 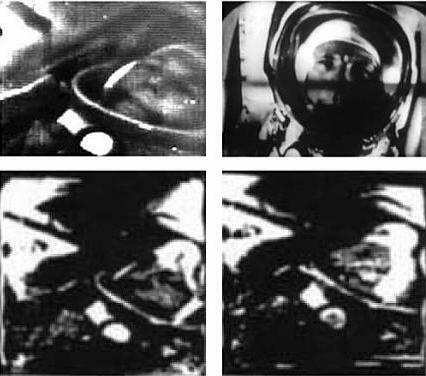 This official photo shows Gagarin under four angles in his cabin...but his cabin only had two TV cameras! How could they take photos under these four angles? 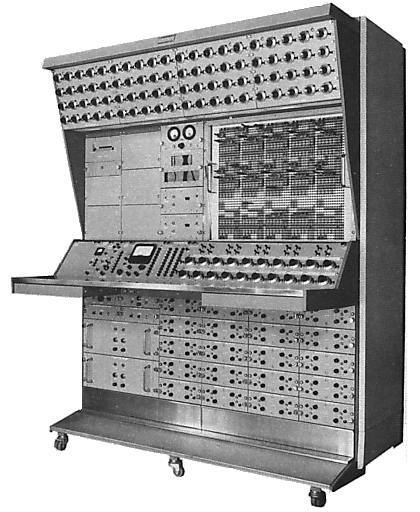 Before all these anomalies, an Illinois representative, Roman Pucinski said it was not possible to accept this exploit without clarification from the Russians. 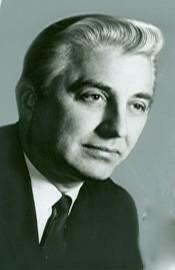 He urged Kennedy to temporize, and get answers from the Russians before accepting the exploit as valid. 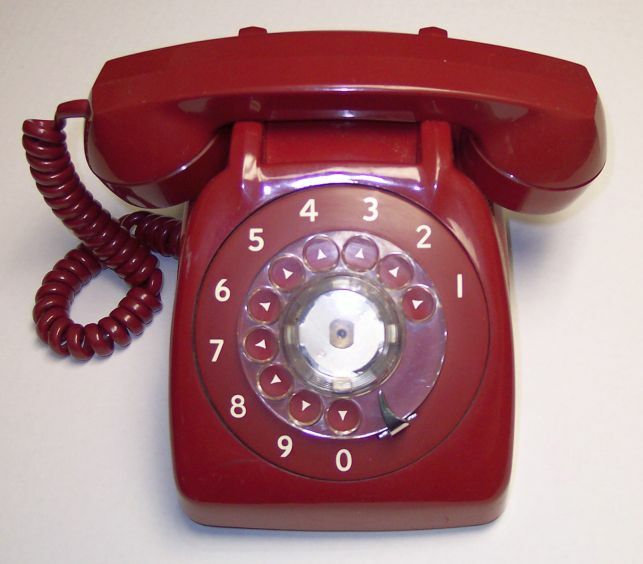 But Kennedy did nothing such; he said the trackings were corrects (when much to the contrary they were clearly showing the time shift between the oral transmission of the actual position of the ship), and phoned to Krutchev to congratulate him about Gagarin's exploit! 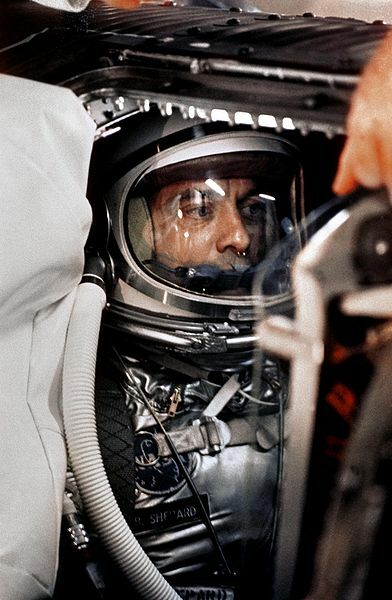 And three weeks later, on may 5th 1961, the Americans were launching their first man to space, Alan Shepard. 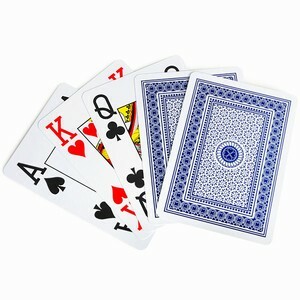 So, why did the Americans accept to lose the honor title of having the first man sent to space, when they had all the cards in hand to prove the Russian hoax? Would they really have accepted that without a compensation from the Russians, and for something bigger than sending a first man to space? 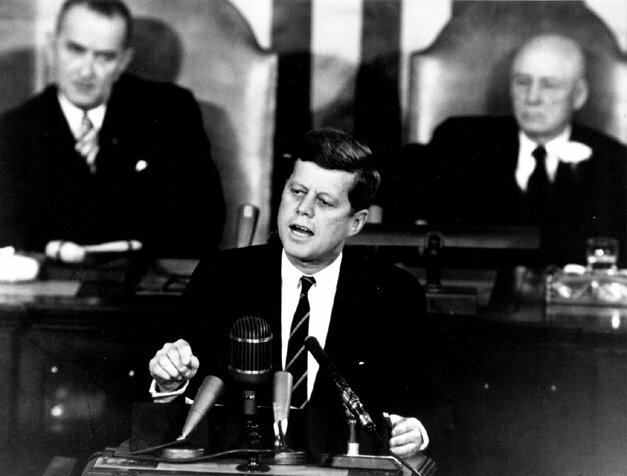 And some weeks later after the pseudo Gagarin exploit, Kennedy makes a speech announcing that the Americans would put a man on the moon before the end of the decade! Before the end of the decade? When the difficulties were so great, and the technology still so primitive, not only compared with the technology of today, but even with the technology of the end of this decade! Nobody was still imagining at that time that the microprocessor would exist! 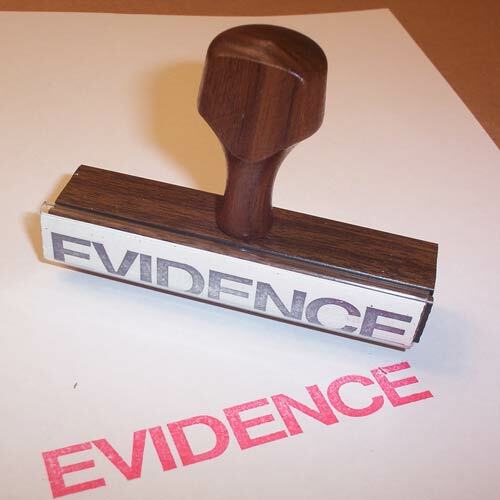 What is one of the main piece of evidence that the Apollo believers are presenting? 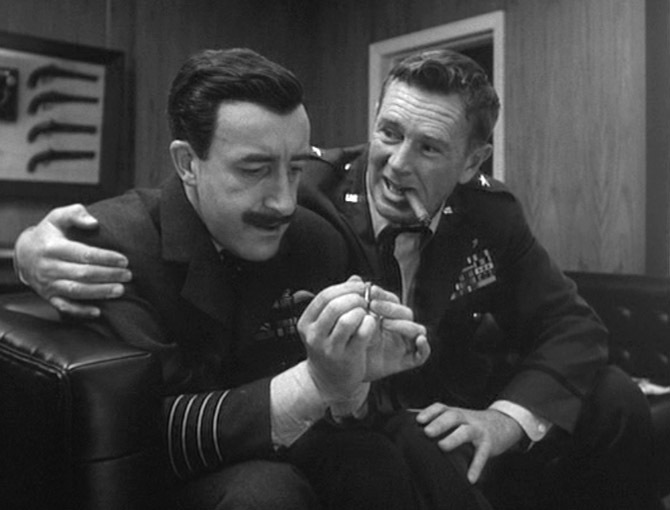 "If it had been a hoax, the Russians would have seen it, and would have exposed it, especially in these times of cold war!" 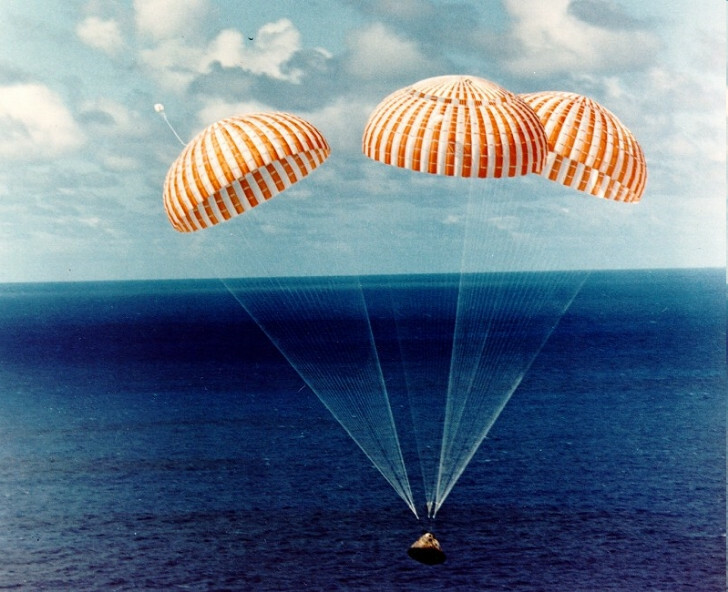 Now, what do you think it would have happened with the Gagarin hoax, with all the proofs the Americans had, the recordings of the flight, if the Russians had talked about Apollo? And losing Gagarin as the first man in space, a legend, would have been catastrophic for the Russians! Why did NASA come forward to vouch for the event they had intelligence information pointing to a hoax? And those who saw what benefit they could take from the Gagarin hoax perfectly knew it. Some people in the American government, looked the other way, and got dizzy about this very bad set-up from the Russians. So was Gagarin at the origin of the Apollo project? Were Russians and Americans politically at odds but behind the scenes planning the big space exploration hoax ? Disclaimer: the work has been extracted from different sources, and some research of my own. I have an honest and perhaps naive question to ask. Given that all those photos of the moon are fake (by LRO's clementine, Zond etc). 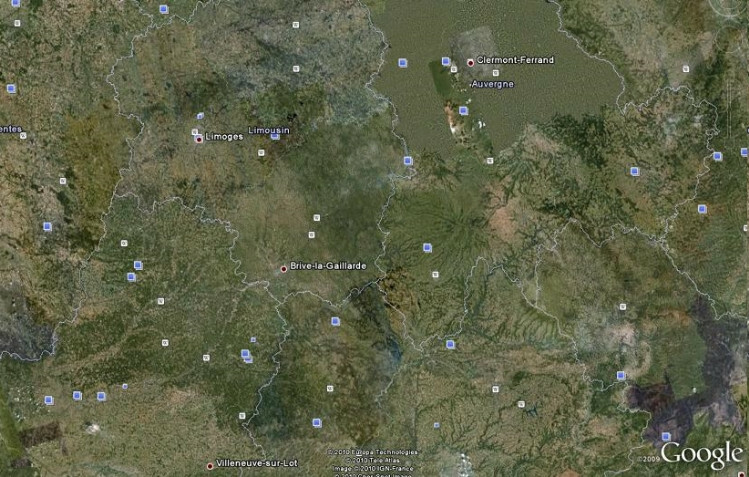 Does it mean that the dark side of the moon, which they have supposedly mapped, and that contains dozens of craters with Russian names, is fake? Does it mean that we haven't ever seen the real dark side of the moon? good question... who really knows ? word for it... i guess ? I remember from a documentary some years ago, a person (being interviewed about the 'space race' etc.) commented that the interesting thing was that the Americans and Russians never seemed to 'compete' against each other in the way one would have expected (e.g. he orbits 20 times, I'll orbit 30 times, he stays in space 50 hours, I'll stay in space 60 hours). They never really went toe-to-toe on anything tangible and tended to do their own thing in isolation and never bad-mouthed each other whilst doing it. Of course nowadays it all looks so suspicious, but at the time we all thought so differently [bear in mind growing up in the UK in they still had us believe the Ruskies were going to come down the Irish Sea and 'invade' through west-Wales ]. 4:45. Interviewer -- While we are talking about the ship in flight: There’s one small mystery which I think possibly you may be able to clear up for us, perhaps not but I’d like to try .. on the day that you were making the flight, or the day Moscow radioes describing you making the flight there appeared on our communist newspaper, the Daily Worker the report that the flight had been made successfully and that the fight(? *) had returned to the earth and that report was dated from Moscow the day before … I am sorry to put it at such length, but this created the impression of course that another flight had taken place and you were flown second and nobody has ever dispelled this yet would you do it now ? where's her astroNOT outfit? who is the other woman? 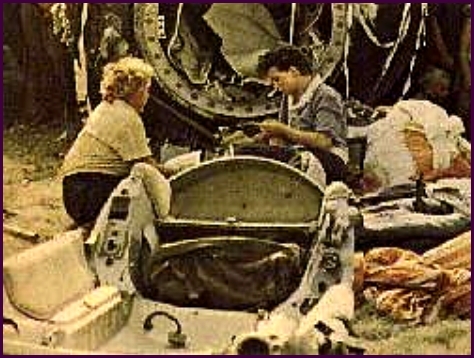 wikipedia wrote: On the morning of 16 June 1963, Tereshkova and her back-up Solovyova were both dressed in spacesuits and taken to the launch pad by bus. 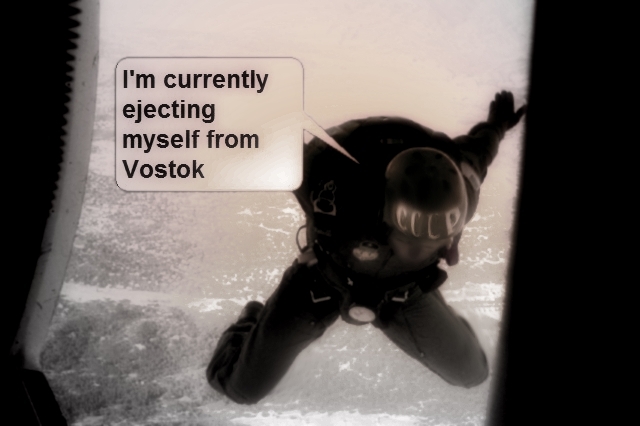 After completing her communication and life support checks, she was sealed inside the Vostok. 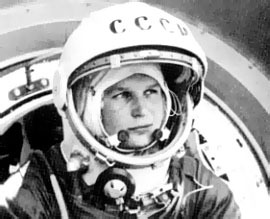 After a flawless two-hour countdown, Vostok 6 launched faultlessly, and Tereshkova became the first woman to fly into space. Her call sign in this flight was Chaika (English: Seagull; Russian: Ча́йка), later commemorated as the name of an asteroid, 1671 Chaika. Is the other woman Solovyova ? At 0:23 we see the Russians weren't as good as Hollywood at matte layering (wonderful black outlines). Al is an interesting character. I also note connections (often whimsical) with Arthur C Clarke, 2001 Space Odyssey, Tom Hanks & Neil Armstrong. In 1991 Al, quite logically, became Vice President of a Moscow bank. Nasa's version of Al's walk is probably the 'best'. Perhaps they knew even at the time that the footage lacked 'believability'... this propaganda film feature's bare seconds of the footage (& only as part of the prologue). I particularly like the rocking(! ), docked 'space craft' at 12min 25 seconds! Sorry I missed much of this thread until now. I thought I would have to start one, but this is great. Yuri is truly one of the most entertaining examples of pure propaganda story telling, largely because he represented an attempt at uniting Russia's pensive, self-hating and intra-hating thinkers into a unified "Russian philosophy" of optimism. I highly recommend going to antique book shops and finding the books and pamphlets that were produced in Russia during his time, which told the adventures of the amazing Yuri Alexeyevich Gagarin, if you can find them. They are prizes of astoundingly stinky kitsch. If I can get my hands on one of them I saw, I'd like to scan it in and post the entire thing here. On a related note, here is a shrewdly written article about Yuri's best friends and experts (who seem hilariously more knowledgeable than Yuri on all space matters). from article (my emphasis) wrote: Porohnya is an important man. 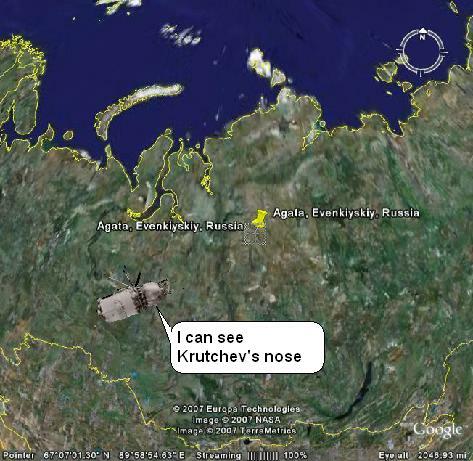 His name googles like crazy in Cyrillic and a carpet with his image hangs on the wall of his living/dining room. He was a success story during Soviet times and remains a success story today. Almost 80, he is currently director of the Centre for History Education overseeing all technical universities across Russia and is head of the historical department of the Moscow Aviation Institute. He has countless titles and is author of more than 100 scientific papers about technology, history, metallurgy and aerospace. Two mutually exclusive statements to be sure, if they could be read as anything but the vaguest philosophical statements ever. "And now for a dog carrying rocket actually taking off"
It may be difficult but I think some of you guys may be able to find a few 'video compression artifacts caused by youtube' in that sequence. Absolutely hilarious! Good find, Critical Mass. I love the giant sparks, er, sorry ... secret rocket formula compression errors. And now for an actual experience you've witnessed with your own eyes depicting what we've said it is. Voila! Alakazam! People buy this stuff as space history, but it belongs in a history of mass hysteria!